A bright and breezy Sunday morning in late August brings with it the first hint of fall in the air. There’s a crispness to the air, and looking out across the backyard toward my pile, I see a single maple leaf, tinged with gold, flutter to the ground. That’s all I need to get started with one of the most pleasurable annual rituals of backyard gardening – transplanting perennials. This year, I’ve had my eye on a patch of ferns that has overtaken a sunny part of the perennial bed. They’ve thrived since I moved a few sprigs from elsewhere in the garden several years ago, mostly to insert some spring greenery to the garden bed that doesn’t appeal to the deer. I’ve since trimmed back some overhanging privet bushes and crabapple tree along the fence that had provided shade – and copious amounts of fruit that the birds love. The ferns are now sunburned and a tangly mess, and I am eyeing several other, more shady spots in the garden for them to go. Just down the way from the fern patch are two hydrangeas that I planted a decade ago, when I was first landscaping the yard. Over the years the plants have grown large and fused into one. Above them, a $10 pin oak I salvaged from the fall clearance sale at Home Depot has now grown thick and tall. I decide to transplant one of the Hydrangeas to the sunny spot. It’s the outdoor equivalent of moving the furniture around. It costs nothing, and gives the yard a new look. Plus, for a backyard composter, nothing compares to digging a hole in a garden bed, filling it a tender plant plucked from the earth or pot and then tucking it in with heapings of fresh compost. For a new planting, compost is both an insurance policy and a deposit guaranteed to pay dividends. As long as I add water, virtually every transplant thrives. Compost is such a surefire potting-soil mix, I even have the confidence to begin the fall transplant season in August. There’s still the risk of a stretch of late-season heat, but with some extra watering, the plants will have plenty of time to properly root themselves before the frost and freeze of winter sets in. I first fill the wheelbarrow with compost, scraped from the side of my pile. As with the supplement to the vegetable garden last week, I don’t bother to sift or screen. I fill half the wheelbarrow with the pitchfork, then shovel up the moist, loose compost that shags out between the tines. Freeing a well-established plant from the ground calls for a tender hand. The ferns roots spread out shallow along the ground. Using the straight-tined pitchfork, I circle around the edge of the root mat, loosening its grip so that I can pull the roots up like a thick carpet. I toss it en masse onto the wheelbarrow, shaking some soil from the roots and untangling the piece into five separate, smaller clumps of shaggy fern. 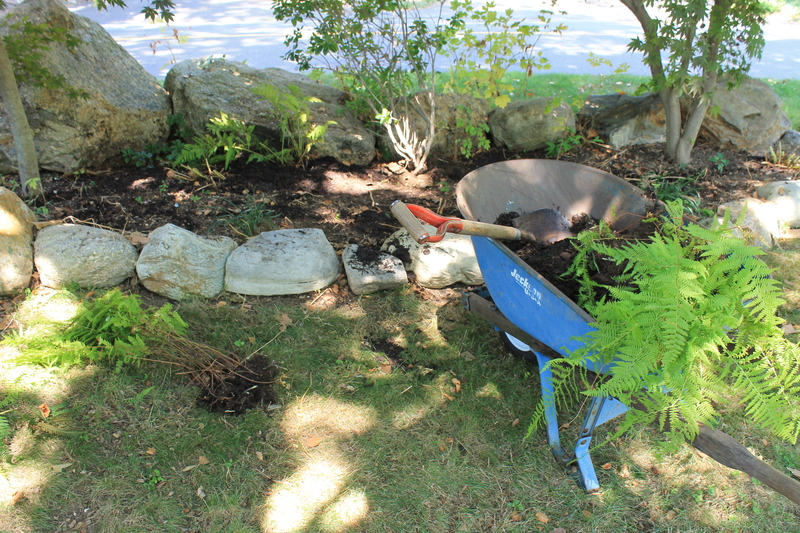 Ferns culled from a now-sunnier spot in my perennial beds will do well in this rock-lined shade garden. Three plantings will go along a small rock wall that contains a small shade garden. Two Japanese maple trees, transplanted eight or nine years ago from coffee cans given to me by my neighbor Jean Luc, bookend the small bed. They are now 15 feet tall and now form a purplish screen between the street and yard. Between then is a rhododendron that blooms small fuschia flowers early each spring. A profusion of bleeding hearts fill the rest of the bed; their branches of dangly pink and white are another springtime show. The ferns will fit right in. I plop the three ferns into their newly made holes, and surround their roots and stalks with shovelfuls of compost, emptying the rest of the wheelbarrow around the slender trunks of the Japanese maples, the rhody and the largest root balls of the bleeding hearts, which I’ve recently dead-headed. The hydrangea, as big around as a Barcalounger, requires a gentler approach to extracting from the ground. After loosening the soil around it with the straight-tined pitchfork, I reach under the root ball to trace the largest roots by hand, following the tentacled threads with my fingers to pull them out in as long and full as I can. Usually one side of a plant’s root ball releases first. I pull the main stem to the side and straddle it between my legs to pull the plant out of the ground. It’s too heavy for me to lift into the wheelbarrow, so I drag the hydrangea on the small plastic tarp to its new home. I widen and deepen the hole left by the smattering of ferns, and drop the hydrangea into it, twisting the stubby base of stems so it sits upright, with its fading bloom balls facing outward toward the yard. 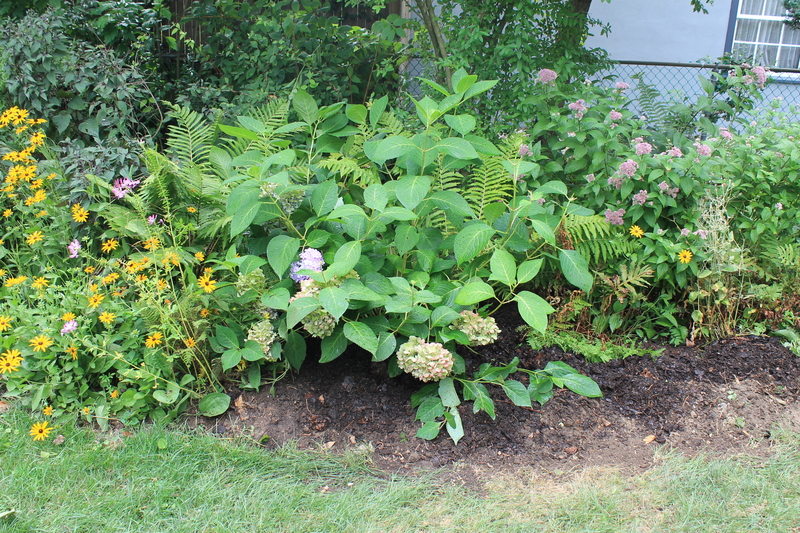 I pour compost around the hydrangea and press the crumbly moist mix into the disturbed soil around it with my foot, creating a circular trench that I fill with water that soaks deep into the ground. This big hydrangea will do well in this spot; later this summer I’ll fill in the empty spaces with more transplanted perennials. The hydrangea blends right in with the rest of the perennials. I add a second wheelbarrow full of compost here and there nearby. I can afford to be generous with compost this year, and there’s no better use for it than as a security blanket for these perennials, uprooted or not.